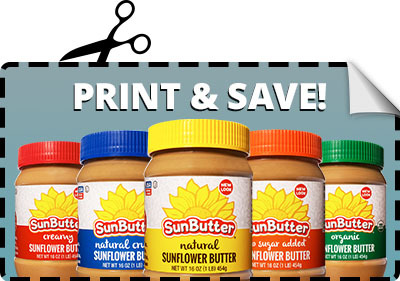 We’ve partnered up with QPLES to give you easy access to printable SunButter Coupons. If you have issues with QPLES, please contact us, and we’ll mail you a coupon – the old fashioned way. We’ve partnered up with our friends at Save.ca to give you easy access to the SunButter Coupon (you may print at home or request a coupon be mailed). If you’re using Save.ca for the first time, it will take a few minutes to set up an account. If you have trouble with this service, please contact us.